AUBURN, Ala. (AP) The Auburn Tigers found a way to win without two key players. Jared Harper scored 21 points, freshman Chuma Okeke had career-highs of 16 points and 10 rebounds and No. 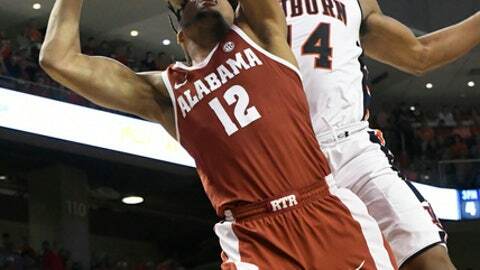 12 Auburn beat rival Alabama 90-71 Wednesday night even without ailing star Mustapha Heron and injured Anfernee McLemore. ”I just knew I had to step up with two of our teammates down,” Okeke said. Down to seven scholarship players, the Tigers (24-4, 12-3 Southeastern Conference) turned a five-point halftime lead into a blowout thanks largely to big performances from Okeke and Malik Dunbar off the bench. Auburn responded with Heron out with a stomach ailment one game after McLemore was lost for the rest of the season to an ankle injury. It’s a familiar challenge for a team that’s played without Austin Wiley and Danjel Purifoy all season. Collin Sexton scored 25 points to lead the Crimson Tide (17-11, 8-7) after missing the first meeting with an abdominal meeting. Bryce Brown scored 18 points for the Tigers despite shooting just 3 for 14 on 3-pointers. Harper also had six assists after a nine-turnover, one-assist game in a loss to South Carolina. ”He controlled the game tonight,” Auburn coach Bruce Pearl said. Okeke, who figures to be a key figure on replacing McLemore, scored 13 points in a seven-minute span of the second half. ”When Chuma’s playing like that, we’re very hard to beat,” Harper said. Dunbar also turned in his top scoring performance with 14 points. Desean Murray had nine points and eight boards. Auburn took command with a 17-2 run after having its lead cut to one early in the second half. ”I told them, `Look, if Mustapha Heron doesn’t play tonight, they’re still a really good basketball team,”’ Alabama coach Avery Johnson said. ”They came out and played with a lot of energy and emotion. Sexton made 8 of 12 shots for the Tide, but other top scorers struggled. John Petty, who had eight 3-pointers and 27 points in the Tide’s January win, missed his first eight attempts and finished with three points. Donta Hall came in hot but had just seven points and five rebounds. Braxton Key had 11 points and Avery Johnson Jr. scored 10 points, both off the bench. The Tigers built a quick 14-2 lead and held onto it until a furious close. The Tide tied it up on Sexton’s drive to cap an 8-0 run. The Tigers answered with eight consecutive points punctuated by Brown’s 3-pointer. Murray hit a layup off an offensive rebound and pass from Okeke, but Sexton beat the buzzer for a jumper to cut it to 40-35 at the break. Alabama: Had won five straight games over ranked teams and could have made a big statement for the NCAA Tournament. Came into the game giving up a league-best 65.6 points in SEC games and allowed its season-worst. Auburn: Moved a step closer to clinching its third SEC title and first since 1999. Game had to be a confidence builder for players like Dunbar and freshmen Okeke and Mitchell. Alabama hosts Arkansas on Saturday. Auburn visits Florida on Saturday night.